War on Christmas: School BANS… candy canes!? The latest battle in the “War on Christmas” just might be the most ridiculous one yet as a Nebraska elementary school principle has almost literally taken candy from babies. She’s taken away candy canes – BANNED them from school – and not because they’re close to 100 percent sugar. It’s because she thinks they’re shaped like a “J” for JESUS! Principal Jennifer Sinclair of the Manchester Elementary School has been yanked off the job and placed on “administrative leave” after going too far even in these politically correct times, according to Fox News. The first-year principal fired off a bitter memo banning nearly every possibly symbol of Christmas, including Santa Claus, Christmas trees and those candy canes. Leaving aside the weird notion of Christ having different-colored blood, she’s wrong about the candy cane (more on that in a moment). Her letter banning Christmas also had an oddly specific list of what’s allowed. Holidays “around the world,” she wrote, are acceptable, and other winter symbols such as “snow people” and yetis are just fine. So, NO to Santa giving out candy canes on Christmas… but YES to a yeti visiting its “snow people” friends on Diwali. And these might not even be the most absurd examples on her list. Along with bans on Christmas, Santa and candy canes, her long list of holiday no-nos included reindeer, Elf on the Shelf, and all Christmas music. She also banned red and green. Yes. She banned COLORS. She even forbid any activity that involved kids making ornaments. Well, now she can challenge her own thoughts somewhere else as she gets put into an adult version of a time-out. Not only did her list go too far by ANY reasonable measure… it was also in DIRECT VIOLATION of her own district’s policies. “Christmas trees, Santa Claus and Easter eggs and bunnies are considered to be secular, seasonal symbols,” the district’s policy states. And while calling these things “secular” might sound like nails on a chalkboard to a practicing Christian, the real-world implication is to specifically ALLOW these things in the school. It stands to reason that if a Christmas tree is allowed, then of course a candy cane would be as well, and the district agrees. Of course, the entire debate may be for nothing. There are dozens of stories passed around on Facebook and Twitter every year about the supposed religious origins of candy canes. Some, like this teacher, claim the shape is a “J” for Jesus, and the red is for His blood. Others say it represents a shepherd’s crook, for the “Good Shepherd” Christ. All of these stories are flawed; even the liberal fact-checking site Snopes found no evidence to back any of them. 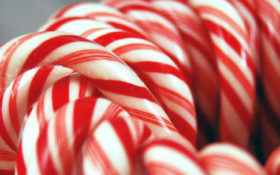 The first known written reference to a candy cane dates to 1866, and it had no association with Christmas. It was simply a candy cane in a store window, and the casual reference implied the readers would know it as a typical candy of the time. The first known link to Christmas is not until nearly a decade later. The website did find one true link between candy canes and religion: The candies had to be bent by hand until the 1957 invention of the Keller Machine, which automated candy-cane bending. Its inventor? A Catholic priest named Father Gregory Harding Keller.